"There are five kinds of families that buy us," says Mrs. B over dinner and drinks with fellow North Korean exiles living in China. "The first type, either the father or the mother is missing and the son can't get married. Then there are the very poor families, like my husband's. In the third type, the man is handicapped... mentally handicapped too. They're all poor. We're sold to families like that." Mrs. B (we don't learn her real name) is something of an expert when it comes to the trafficking of North Koreans. In 2003, at age 37, she left her husband and two sons behind in North Korea, crossed the icy Tumen River into China, and was sold into marriage. When we meet her a decade later, she's running a robust trafficking business from her home on a small farm in northern China. While her husband fixes equipment and brings in the harvest, she's on her cellphone negotiating with people smugglers, bringing in karaoke girls, and advising newly smuggled clients on how to avoid detection and deportation. MRS. B, A NORTH KOREAN WOMAN is a closely observed verite portrait of a world-weary woman who finds herself between countries, between worlds, and between families. Unable to bring her North Korean family to China, Mrs. B eventually arranges to get them into South Korea (where her husband was originally held under suspicion of espionage). Now, she plans to return to Seoul herself, seek refugee status, see her Korean husband and sons again, and then send for her Chinese husband and his octogenarian parents. Director Jero Yun runs considerable risks, jammed into the back of a car with Mrs B as she welcomes a newly smuggled young mother into the country, and joining her and a group of women as they travel all the way across China to Thailand -- by bus and car, and on a long night-time trek through fields with a crying baby -- seeking a better life. 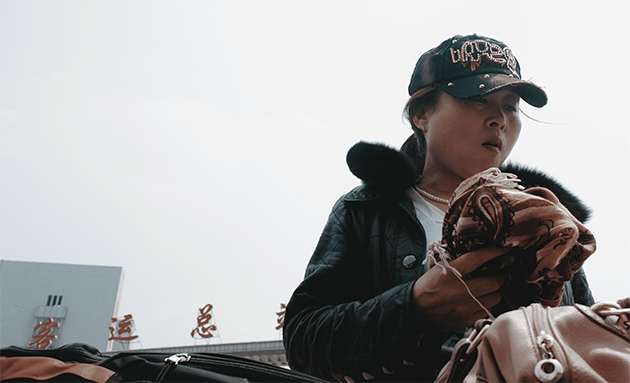 By focusing so tightly on one person, Yun offers a powerful look at the mundane realities of life for both trafficker and trafficked, overturning cliched notions about a necessarily mysterious trade.